Custom Solar | Solar Gardens Are Sprouting Up Everywhere! Solar Gardens Are Sprouting Up Everywhere! The Solar Gardens Institute is becoming a central clearing house for solar garden hosts, subscribers, developers and financiers. 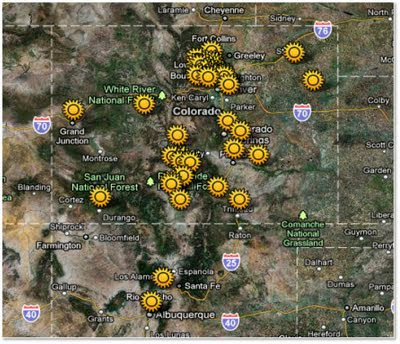 Interest has been growing rapidly in Colorado for some time and in June 2010, the legislature passed the Community Solar Gardens Act, spurring even more demand. The map above shows some of the locations where a land owner, municipality, homeowners association or citizens’ group has expressed interest in locating offsite solar. Ideally, we’d like to have at least one site for community owned energy operating in each Colorado county served by XCEL Energy or Black Hills Energy, as well as one for each rural or municipal utility. To acheive this would require 60 or more sites. XCEL has set rules that limit solar gardens to a total capacity of 6 MW per year for the first three years, and the amount allocated in Black Hills would be significantly smaller. These sites could easily fill that quota until 2014 and keep going, with over $100 million worth of projects. Colorado is even shaped like a solar panel. The map at left shows the interest the Solar Gardens Institute has received for our program around the United States. These include specific sites for development, and proposals for new state laws. And this is just one company! On analysis of the map, I notice some interesting things – interest in community power is widely spread through the nation, in both red and blue states, in urban and rural areas. People facing industrial-scale energy development or transmission lines tend to get active in distributed generation. As interest expands, this will provide a truly vast economy of scale – a solar power plant the size of America, located on rooftops and parking lots, landfills and spent agricultural land. While community organizing takes time, we can build it much more quickly than transmission lines or large desert projects. Community solar uses bankable, proven technology, and if done in a truly “bottom-up” fashion gets support rather than opposition. Big money has begun to take notice, and I have been taking phone calls from a small island in the Hudson River. American corporations are sitting on top of an enormous amount of cash – and communities are clamoring for projects. By bringing projects together, we can keep local control while putting that money to work. It’s not just an American phenomenon. In a future post I will be examining Solar Gardens Going Global, and community power of all kinds growing around the world. The information and views expressed in this blog post are solely those of the author and not necessarily those of RenewableEnergyWorld.com or the companies that advertise on this Web site and other publications. This blog was posted directly by the author and was not reviewed for accuracy, spelling or grammar.